By far the commonest cause of heel pain in those aged over 40 is Plantar Fasciitis. This occurs on the underneath of the heel and is caused by inflammation of the plantar fascia and plantar ligaments, where these insert under the heel bone. Why should I choose Devon Square Podiatry? 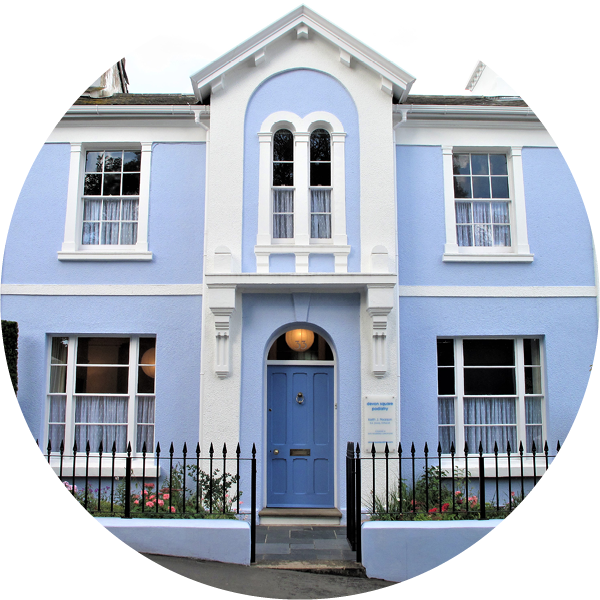 Devon Square Podiatry is a long established, professional podiatry practice. Our practitioners are fully qualified professionals and are registered with The Health and Care Professions Council and are members of the Society of Chiropodists and Podiatrists. What will a visit to our clinic will involve? At the other end of the age range Children in the 6-12 age group can develop discomfort at the back of the heel at the point where the Achilles tendon is attached to the heel bone, causing pain and swelling. This condition can occur in episodes over a number of months. The problem is self-limiting and resolves without treatment though reassurance is important and a temporary heel raise helps. Lumps and bumps on the back of the heel can cause concern. Raised fleshy pads on the outside rear of the heel often appear during teenage years and are caused by shoes with a low heel counter, or where the top of the heel counter is too tight. Their owners may find them unsightly but they are generally painless. Good footwear choices are the key. By contrast, a painful area in the centre of the back of the heel could be an inflamed bursa (a fluid filled sac under the tendon to cushion it against bone). When subject to excessive wear and tear it can become enlarged and painful. The part of the Achilles tendon above the heel can become subject to inflammation (tendonitis) – showing a sausage like swelling above the back of the heel bone. This short-term sudden onset condition would be treated with Rest/Ice/Padding and Ultrasound.